Sara Herrin, MSN, FNP-C, is a nurse practitioner in the Head and Neck Oncology Clinic at Emory University Hospital Midtown. Prior to joining Emory, she was part of an outpatient oncology group where she treated both hematology and medical oncology patients. She also has extensive experience as an outpatient infusion nurse. In addition to oncology, she has clinical nursing experience in the cardiac intensive care unit and pediatrics. 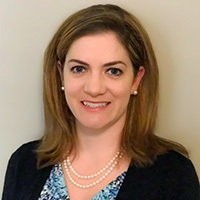 Ms. Herrin holds a master of science in nursing from Kennesaw State University as well as a bachelor of science in nursing from Mercer University and a bachelor of science in psychology from University of Georgia. She is board certified by the American Academy of Nurse Practitioners and is an inducted member of Sigma Theta Tau International Honor Society.